Art and computer science converge in the investigation of emer­gence and self-organization through the field of sensor networks. This is realized in Bion, an interactive installation that explores the relationship between humans and a simulated orgone-inspired experience. Bion makes reference to an individual element of primordial biological energy identified as an “orgone” by the scientist Wilhelm Reich. 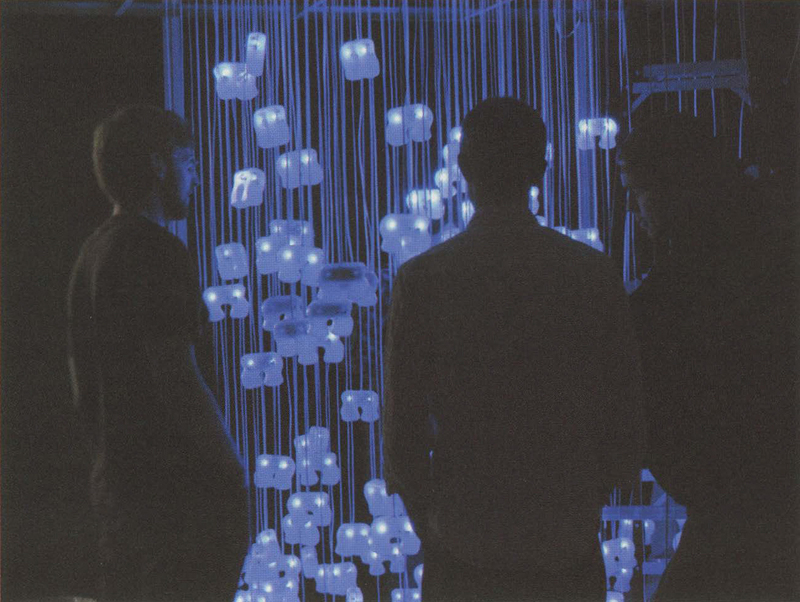 Viewers witness a dynamic array of 1,000 mass-produced, three-dimensional glowing and chirping forms, collectively producing polyphonic sound and blue light emanating in cloud-like patterns from all parts of the room. Each bion, a small synthetic “life-form” fitted with custom electronics and sensors, has the ability to communicate with other bions and with humans who enter the space. An example of this communication occurs when one of the bions is alerted to the presence of a stranger; a bion quickly communicates this information to the group. One by one, in rapid succession, the bions signal other bions to the presence of a stranger and, in a wave-like pattern, become silent. Eventually, the bions become attracted to the visitor, and they express their interest with more intense glowing and increased polyphonic rhythms. Each bion was initially realized through a 30 computer-aided design model. This digitally produced file was then output to a CNC (computer-numerical-controlled) machine, where an aluminum mold was made, creating an infinitely reproducible object via the rapid injection molding process. Each of the 1,000 bions is outfitted with custom circuits and Atmel Mega8 micro-controllers that are suspend­ed by fine-gauge wire connected to panels attached to the ceiling. Communication and visitor-proximity sensing is performed using a set of infrared transceivers (not unlike the technology used for television remote controls). Because this mode of communication is local, the system uses a broadcasting model for global communi­cation. Here, messages that are received by individual sensor nodes are rebroadcast to the local neighbors. This process is repeated until the message propagates throughout the network. All sensor nodes are identical in their implementation. However, when a node comes in contact with a visitor to the installation, it asserts itself as the network’s “interface” to that visitor. As the interface, this node is responsible for originating the set of messages that are used by the network to produce the coordinated response to the visitor.